40 Million Credit Cards — VI. A first woman stands in the background. A first man, a second man, a second woman, and a third man are seated at a round table. Third man: --isn't that good for us? First woman: Yes, if the sender never finds out. The next panel shows only the second woman and the third man, in a closer view. Off-panel voice: Otherwise, they make us return about twice as much. 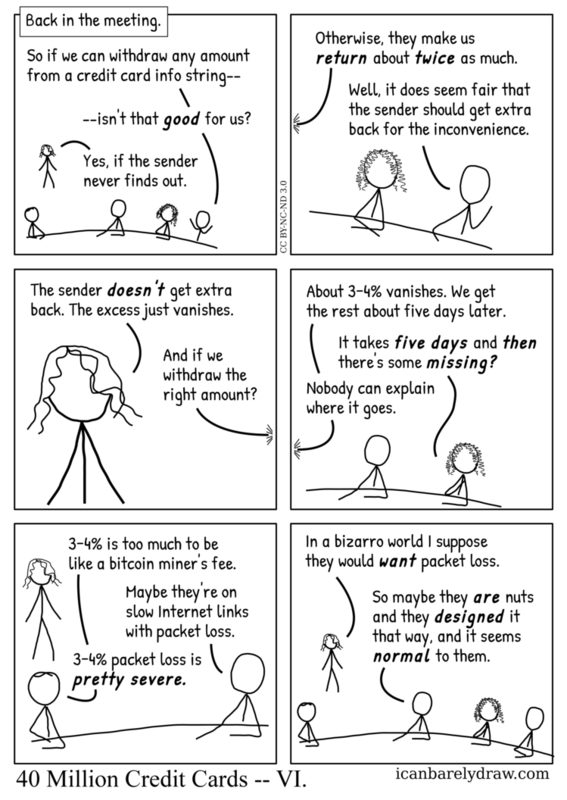 Third man: Well, it does seem fair that the sender should get extra back for the inconvenience. The next panel shows only the first woman in a close view. First woman: The sender doesn't get extra back. The excess just vanishes. Off-panel voice: And if we withdraw the right amount? The next panel shows only the second man and the second woman. Off-panel voice: About 3–4% vanishes. We get the rest about five days later. Second woman: It takes five days and then there's some missing? Off-panel voice: Nobody can explain where it goes. The next panel shows the first woman, the first man, and the second man. First man: 3–4% is too much to be like a bitcoin miner's fee. Second man: Maybe they're on slow Internet links with packet loss. First man: 3–4% packet loss is pretty severe. The next and final panel shows everyone in essentially the same scene as in the first panel. First woman: In a bizarro world I suppose they would want packet loss. Second man: So maybe they are nuts and they designed it that way, and it seems normal to them. Title: 40 Million Credit Cards -- VI.